In order to provide evidence to support theory on participatory systems beyond the project pilots, EMPATIA research consortium has conducted two mapping exercises to collect and analyse larger datasets. The EMPATIA consortium has partnered up with IODP and Participedia to conduct an innovative survey of research design that combined crowdsourced mapping with experts’ interview, to better understand the relevance of the initial hypotheses generated by EMPATIA. The objective of this side-project was to test and revise these hypotheses, by comparing with the experiences of cities that have adopted multichannel engagement platforms. In March 2017 we deployed a crowdsourcing website for the entire IODP network based on the methodology pioneered by Participedia, but significantly simplified to reduce the cost of submitting information (passive tool). In practice the crowdsourcing website is a combination of a very simple survey (15 questions), a map and a set of instructions and guidelines. The survey website was made available English, Portuguese, French, and Spanish. The information gathered via survey website has enable us to test how practitioners and academics see and understand the language and framework developed around multichannel participation. 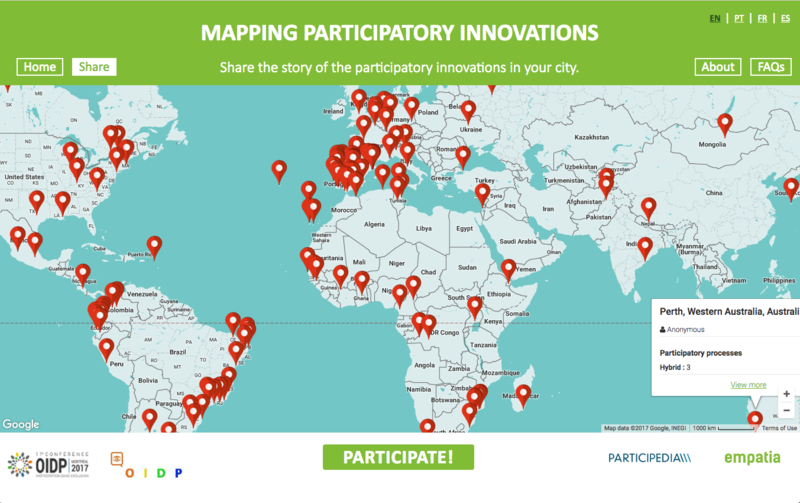 The results of these survey – based on 135 cities that replied to the survey – suggests that almost all implement some kind of participatory system. This is quite important to understand the crucial importance of the development of platforms, such as EMPATIA, that can rationalize and optimize multichannel innovations and integrate them in participatory systems. Further details about the results are available here.